Last time I took the story of trout breeding at Horton up to 1906 when the MAA decided to seek a more favourable location for their hatchery at Horton. After much research and debate it was concluded that a site by the banks of Brants Ghyll on Jackie meadow would be most suitable and the land was duly purchased. A fund was set up to cover the cost of constructing the fish ponds and breeding house to which members of the Association were invited to contribute. On 28 September 1907 the facility was duly opened the whole effort having cost the club the grand total of £245 with most of the excavating, concreting and construction having been done by local labour. The site was well thought out. To the east on level ground stood the fish breeding house, a large wooden hut containing several tanks which in turn held the frames of glass rods on which the 25,000 or so trout eggs, supplied from the famous breeding station on Loch Leven and native Ribble fish, were laid to hatch. The house was supplied with water via a 6inch pipe that had its inlet in the Ghyll. Water continuously flowed through the tanks bringing oxygen to the developing eggs before exiting via a waste pipe back into the beck. A larger tank also sat in the house ready to hold the hatching fry as soon as they had absorbed their yolk sack and were ready to start feeding. It was the keeper’s daily job to feed these fish and old Walker was never without his phial of finely minced liver safely tucked into his waistcoat pocket which was reckoned to be the best sustenance for tiny trout. To the west of the fish house were eight shallow ponds or ditches which were supplied with a constant trickle of water. In these were raised shrimps and snails to provide an ever ready source of food for the growing fish in the large fish ponds. Further to the west of these ditches lay the five fish ponds or rearing tanks. These too were kept constantly supplied with fresh water via a second six inch pipe. Into the first were placed very young fish from the tank in the breeding house to live and grow on for about a year. After that they were transferred to the second tank and the first was drained down, disinfected, repainted with bitumen and restocked. After about six months the growing fish in tank two were ready to move to tank three where they grew on for a further six to nine months before being transferred to tank four. From this tank about 2000 fish each year were transferred to the river at various points. Tank five was used to grow on larger fish for the Tarn at Newhouses. 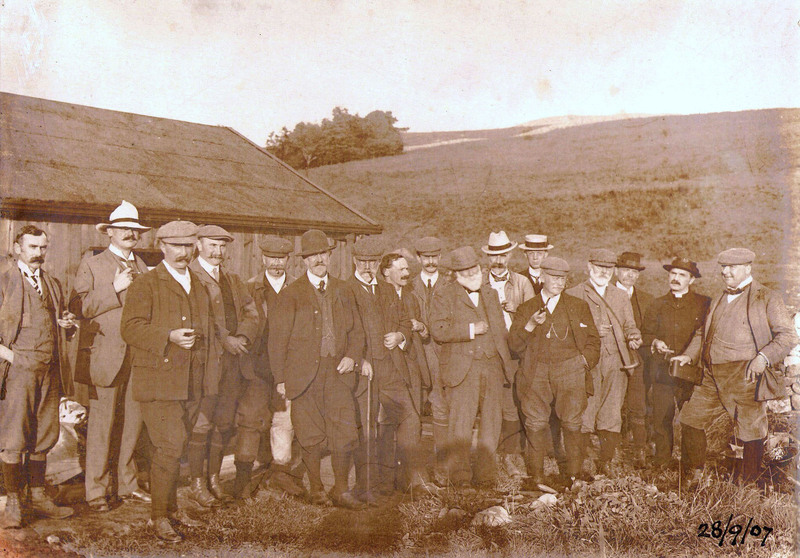 After the first year a mix of eggs from Loch Leven and Horton fish was used and this regime persisted until 1946 when it was decided that it would be far cheaper and less trouble to buy in farm bred trout for both the river and the Tarn. It’s a testament to the thoroughness of Edwardian endeavour that the fish rearing tanks survived until the present day largely intact despite 60 years of rain and frost. Things have now come full circle and once again the silence on Jackie meadow is broken by the gentle trickle of water into three of the old tanks which in due course will hold native crayfish and young wild trout. The photograph shows the opening ceremony at the Brants Ghyll hatchery. The gentleman second from right, front row with the father Christmas beard is Abel Hayward jnr, son of Abel Hayward snr, publisher, leading Chartist and former Lord Mayor of Manchester whose statue stands in front of Manchester town hall. Abel Hayward jnr. was instrumental in founding the MAA in 1878, editing and publishing it’s three much sought after journals Anglers’ Evenings. These three volumes collect together the presentations made by members at Association monthly meetings and provide a fascinating insight into middle class leisure at the end of the 19th Century. The Document below provides the full history written by David Marsden of both hatcheries.